John Dodds points out that someone over in Honda F1 marketing must be paying attention to global trends. Launching myearthdream.com, Honda are bringing together an increasing global interest in global warming and environmental issues and employing one of the Internet’s greatest hits of last year — the million dollar homepage. At this site, you can pledge money to a registered charity (the trust will distribute funds to environmental charities around the world) and in return you can have your name appear on a pixel on the car. There are 600 pixels per car and there are two cars. 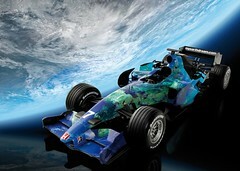 The cars will be unveiled at the first Grand Prix in Melbourne on 18 March 2007. "Give up ironing – Endorse the crumpled look. An iron uses as much energy as a kettle is it really worth it? A great excuse to avoid a household chore!" While I like this site and the idea behind it, it is a shame that there are a couple of things missing from the execution — a "blog this" function for the site — and a good copy editor. Not to mention a failure to look at the irony of their actions. I’m with Ryan on this one. Can’t really see the link between gas guzzling cars and all the environmental havoc that they cause and raising funds to address global warming. Buy a pixel. Help pollute the planet.